Staying in Bach Tung Diep Hotel, you could enjoy not only beautiful and romantic view but also professional services and facilities provided. With motto “Smiles everywhere”, we do hope that we can make all visitors feel very satisfied when spending your time in Bach Tung Diep Hotel. On the ground floor of Bach Tung Diep Hotel, we have the Blue Note café could serve more than 50 guests with all kinds of cuisines from traditional Vietnamese and Asia – Western. 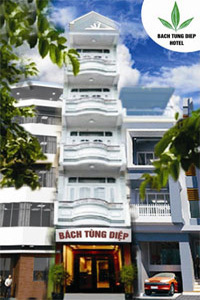 Besides, all the guests stay at Bach Tung Diep Hotel being free breakfast. Blue Note Café - A place you can let your feelings tangle to the natural sounds through our hand-made analogue equipments, such as turntable, tube amplifier... A place you can play along with your favorite musical instruments. A place you can find a part of music world from our original CD and Vinyl collection.